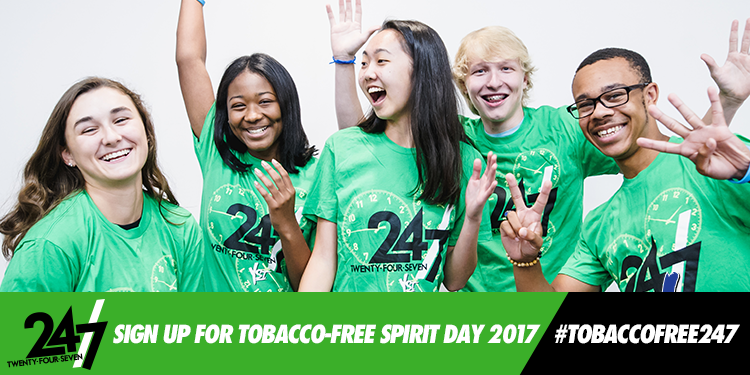 Celebrate Tobacco-Free Spirit Day 2017! On February 15th, 2017, schools in divisions with 100% comprehensive tobacco policies will celebrate Tobacco-Free Spirit Day. Schools and divisions across Virginia will showcase their commitment to being tobacco-free by hosting fun and informational school-based events for students, staff, and visitors. Schools that participate will receive an “Event-In-A-Box” kit, complete with 24/7 gear and ready-to-use activities. Additionally, schools that participate will have the chance to win $247! Visit 247campaignva.com/spiritday to learn more, find out if your school is in a comprehensive division, and apply to host a Tobacco-Free Spirit Day event.